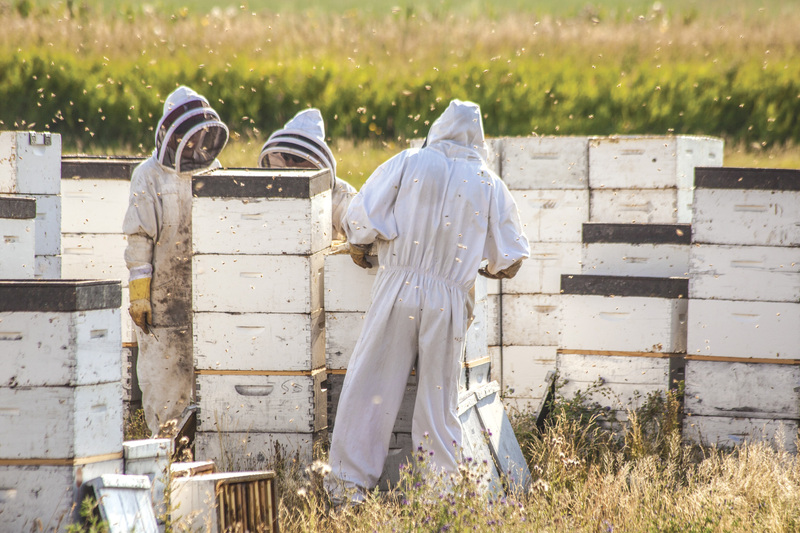 On a late summer day, in the otherwise idle and quiet whistle-stop known as Power, Montana, Mark Jenson and his harvesting crew are making one heck of a racket inside their Smoot Honey extracting plant. It would gather the attention of a small crowd, if such existed in this barely populated crossroads just east of the Rocky Mountain Front. Stacks and stacks of weathered white pine boxes, known as honey supers because they store a beehive’s overflow of honey, line similar colored corrugated tin walls. 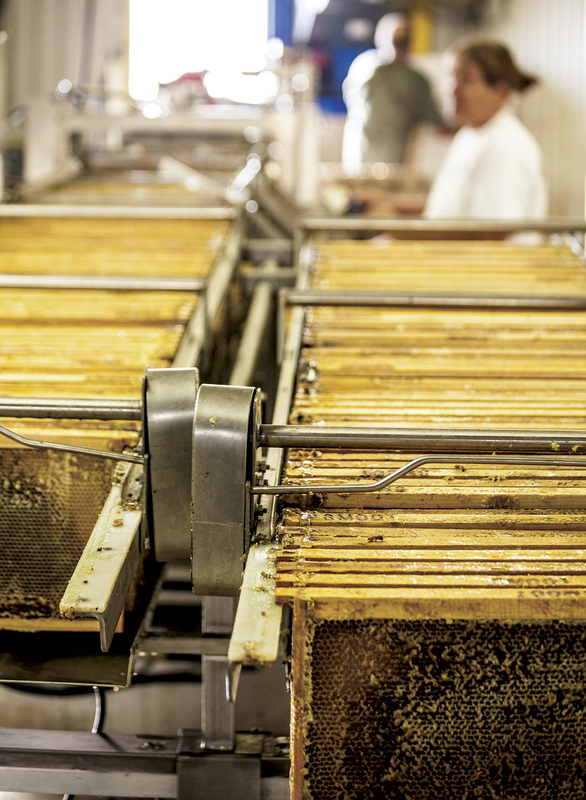 Jenson stands at one end feeding the extraction machine with thin honeyed frames. As the honey spins out onto they conveyor it glistens in shades varying from deep rich golden brown to espresso, randomly punctuated with a shimmering crème hue. Despite the light September breeze, temperatures feel tortuous mimicking a blistering mid-July heat wave. 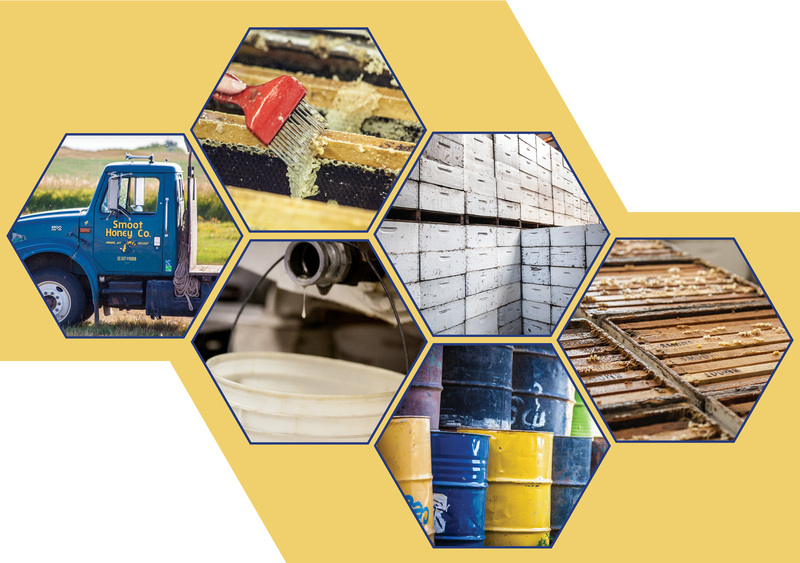 During harvest season the extraction room is kept between 90 and 100 degrees, the same internal temperature of a beehive, to keep the honey flowing through the extractor. The air is thick, filled with the heady, sweet aroma of honey. A few honeybees wander about, appearing disoriented, though not at all panicked over the harvesting of their latest summer crop of liquid gold. Smoot Honey’s crew began their 2013 honey harvest mid-July and will continue to pull honey supers for harvest well into mid-October. 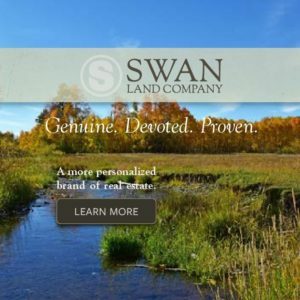 With 5,500 bee colonies (equal to around 42,000 actual bees) spread over 160 landowners sprinkled throughout a 90-mile radius running north to Conrad then south and east along the Marias and Teton Rivers into Great Falls, the locally owned company hopes to process over 600,000 pounds of honey this year. 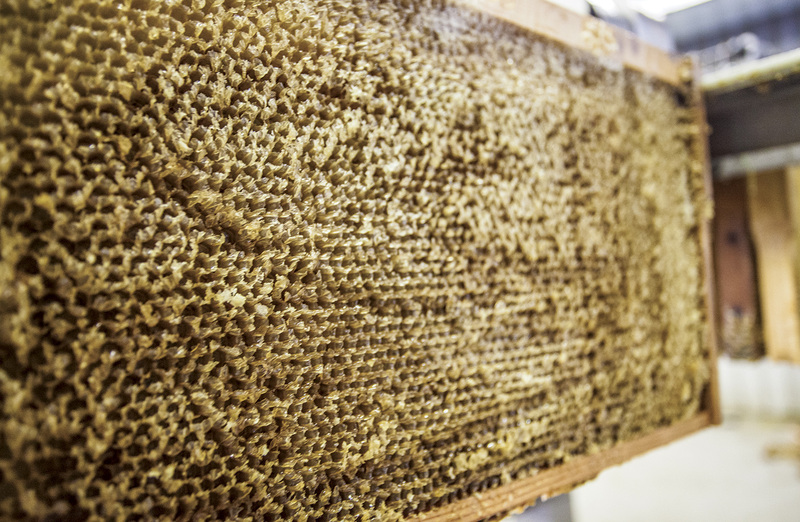 “We’re still looking for that million pounder,” comments Jenson as he deftly runs his hive tool, a small flat pallet knife across narrow pine frame stained a lovely golden brown, each of its pencil tip-sized honey comb cups overflowing with this year’s honey crop. 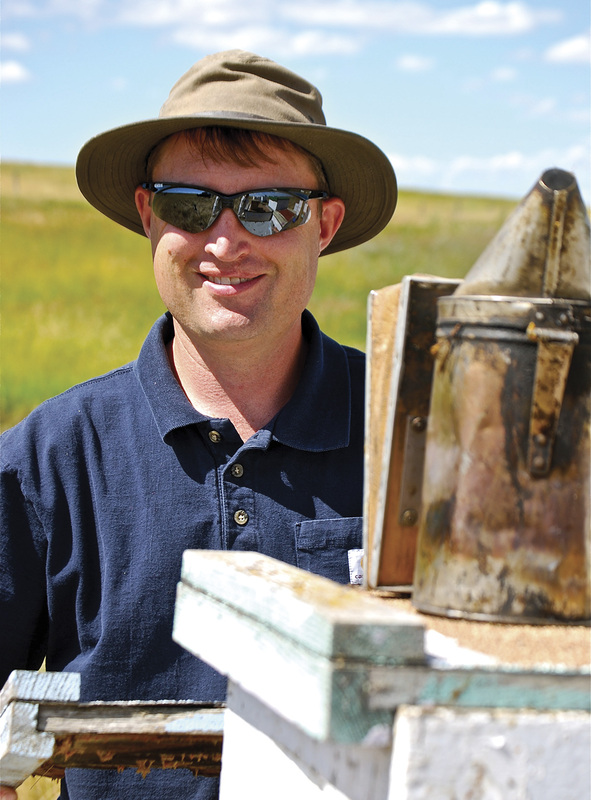 Unlike many commercial growers in Montana, Smoot doesn’t winter over their bees or follow the harvest season south when the snow flies. Each May they truck in packages of Carniolan and Italian honeybees just fresh off pulling in California’s orange crop. At the end of each season they ship them back just in time to help out the West Coast almond growers. “We’re farmers like everyone else around here and we’re diversified enough that we get to stay put and be part of the local engine during the winter,” says Jenson, while walking down the length of the honey extracting machine. His shoes make a sucking sound, sticking to the honey-laden floor. Jenson, his wife Carrie, along with Carrie’s brother Dan Smoot and their cousin, James Rehn, bought the business from Carrie and Don’s father in 2007, though they’d been working with Smoot Honey since 1995. Carrie’s grandfather started Smoot Honey during the 1930s in California. 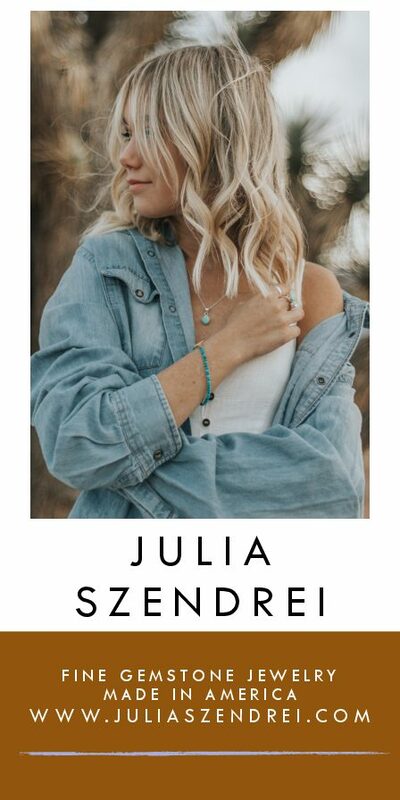 He sold the business to her father, Don Smoot, a little over 30 years later. “Don got tired of being beat up by pesticides in the California orange groves,” Jenson explains as he takes a peek into an oversized stainless steel tank where centrifugal force separates honey from everything else (like wax, twigs and a few bee parts here and there) before it goes into a settling tank, then a barrel for storage. The family looked at beekeeping businesses in Canada and Wyoming before settling on this one in Power, Montana. Here, Smoot Honey found an agriculturally bee-friendly area and an agreeably great place to raise a family. “Our operation is as close to organic as you can get,” says Jenson. “We don’t use chemicals in our bees and our farmers do a good job of taking care of bees by taking care not to spray during the day while they’re working.” Smoot Honey sells the majority of their honey on the open market to processors, holding back several hundred barrels for local customers like the Great Harvest Bakery in Great Falls, Daley’s Premium Meats in Missoula and Madison River Brewery in Belgrade where they use Smoot Honey to make their tasty Salmon Fly Honey Rye beer. 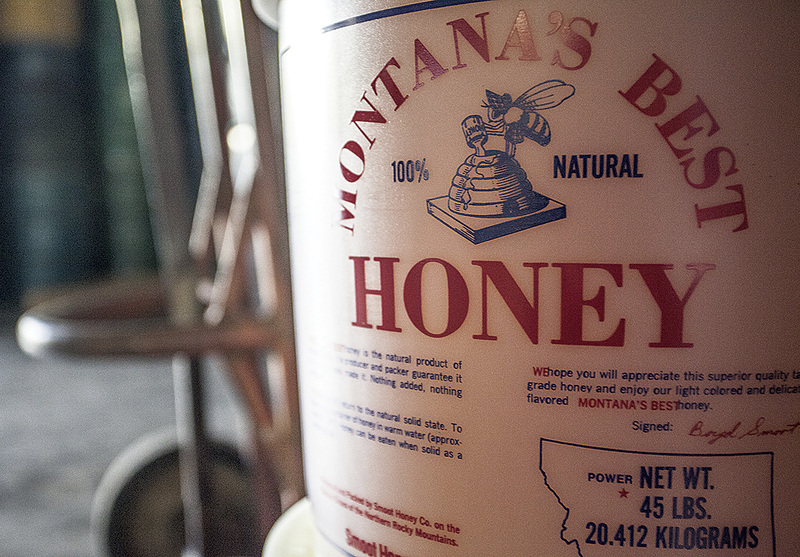 They also private label their honey under the name “Montana’s Best Honey,” known locally as “Smoot’s” in the greater Great Falls area. Once the honey is withdrawn, wholesome wax is left behind. Andrew Jensen, Logan Smoot and Ron Richeson work to gather honey on a hillside overlooking Freezeout Lake. Their protective suits are duct taped at the wrists and ankles, assuring no exploratory bees venture too far. Johanna Mellinger (fore) and Gene Walker withdraw honey in the extraction room. Smoot Honey uses Italian and Carniolan honey bees, brought in each year fresh from California’s orange harvest. The bees readily outnumber the workers in the extraction plant, seemingly overseeing the processing of their precious gold.